Originally published under the title "French Lessons." The Bastille Day attack in Nice, France last night should cause the Democrats to reconsider their gun control approach to counterterrorism. After San Bernardino and then Orlando, Obama, Chuck Schumer and others have been citing jihadi terror attacks to support their domestic legislation agenda. France is about as close to a national gun-free zone as you can get. Lesson number one from France is that gun laws will not stop jihad terror. There are no gun show loopholes in France, because there are no gun shows. There are no mandatory waiting periods, and there is no debate about gun control. Everybody agrees that guns are bad, so only the police have them. Or at least that was the plan. But of course the people who don't obey laws have guns. They are called criminals. Lately a lot of them happen to be Jihadis. Lesson #1 from France: gun laws will not stop jihad terror. Remember the touching father and son scene last November, after a jihad attack in France, where Parisians were consoling themselves in the modern fashion with flowers, stuffed animals and candles? A conversation between a reporter, a young father and his little boy was captured on French television and "went viral." The boy was worried about all of the bad guys with guns. His father told him not to worry "They've got guns but we have flowers." Lesson number two from France is when your enemy has guns, flowers will not suffice. So another jihadi has used guns to kill French citizens. This one was also prepared to use grenades (also illegal in France). But he also used a truck, reminiscent of Mohammed Reza Taheri-azar who in 2006 drove his SUV into a crowd of people on the campus of the University of North Carolina, Chapel Hill injuring nine. Lesson #2 from France: when your enemy has guns, flowers will not suffice. Banning firearms did not prevent the Nice, France attacker from finding and using firearms. It did not prevent the Bataclan killers, or the killers at the Charlie Hebdo offices, or the killer at the Hyper Kasher Deli, or the killer at the Jewish school in Toulouse. Nor did it prevent the Moroccan jihadi on the train in Paris, who would have done much more damage had it not been for the valiant efforts of three type-A, gung ho Americans with nerves of steel. While the crew of the French train ran away from the shooter, Spencer Stone, Alek Skarlatos and Anthony Sadler ran towards the gunfire and subdued him. Lesson number three from France is that only by fighting back can you survive. Banning firearms as a way of preventing jihadi terror pretends that jihadis (and others), suddenly unable to find firearms, will give up on their plans. History says otherwise. There will still be black market firearms. And banning legal firearms makes it very unlikely that civilians under attack will be able to defend themselves. There are not many Stones, Skarlatos or Sadlers in the world. Lesson #3 from France: only by fighting back can you survive. In Belgium earlier this year the jihadis didn't even use guns but instead bombs – just like the jihadis who attacked the London underground in 2005, the Madrid trains in 2003, the Bali night club in 2002, the World Trade Center in 1993. 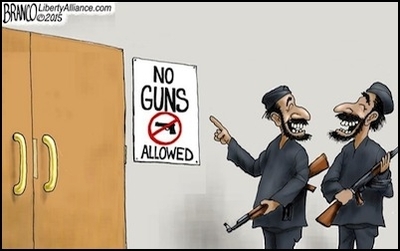 Trying to prevent jihadis from acquiring weapons by passing laws that outlaw weapons misses two points: they will ignore these laws and get the prohibited weapons anyway, or they will find things that can be used as weapons. Wasn't that the "tactical" lesson of 9/11? After 9/11 when the U.S. government created more government (DHS, TSA, ODNI) in response to jihadi terrorism and then began confiscating weapons from airline passengers – scissors, tweezers, nail clippers – rumor had it that the Israelis thought we were crazy. Our attempts to interdict weapons rather than those who would use them seemed counterintuitive to good counterterrorism. All these years later and another president is still chasing weapons. Of course finding those who would use weapons in attacks as part of the global jihad movement – whether they call themselves members of Al-Qaeda, ISIS or the Jabhat al-Nusra Front – requires that one look for jihadists.